This three part lecture series on The Essential Berkeley and Neo-Berkeleian Idealism/Empiricism will be given by Prof. David Berman as part of Trinity College’s Berkeley Initiative. All three lectures will be held in the Neill Hoey Lecture Theatre, Trinity Long Room Hub Building, Fellows’s Square, Trinity College Dublin. The lectures are free, but registration is required on Eventbrite. “John Tyndall Resurrected”, Wed 4 March 2015, 7pm, Royal Institute London. On Wednesday 4th March 2015 at 7pm there will be special event to celebrate the launch of the first volume of Tyndall’s correspondence. Royal Institution historian Prof Frank James is to host an evening of expert talks on Tyndall’s early life, his relationship with the Ri and the future of collaborative humanities research. Free to Ri members, £12 standard admission, £8 concession. Further information here, book here. John Tyndall’s showmanship in the Ri Christmas lectures is described here and the Tyndal Correspondance Project has its website here. “An evening with Wittgenstein” sees the launch of the play-text Wittgenstein – The Crooked Roads, by Methuen-Bloomsbury Drama, together with a talk on the Wittgenstein family by Margaret Stonborough, Ludwig’s great niece, and the first showing of a filmed scene from the play. Attendance is free; for more detail and to book see ACF London. Depiction of George Boole in stained glass, Aula Maxima, UCC. There will be a number of lectures to commemorate the George Boole Bicentenary. The first addressed George Boole’s legacy and is now available to watch online here. This event will be held in the Boole 4 Lecture Theatre on Thursday the 5th of February 2015 from 6pm to 9pm. All are welcome. The lecture is free to attend but registration is required, please click here to register. For further information see the George Boole website. There will be other events held throughout the year. Visitors to Cork may wish to go on the Being George Boole Tour running from February to December 2015. Is the sun setting on GPA Bolton Library? Photography is not permitted in the library, but the Heritage Council report on the Library contains images of the interior and of many of the books mentioned below. The collection includes 11,000-12,000 items. These include fragments of papyrus, 15 manuscripts predating 1701, 45 books printed before 1501 (incunabulas), letters, maps and 200 pamphlets. The oldest manuscript, on vellum, dates from the 12th century and includes an early example of the use of zero. The finest Irish manuscript comes from the hand of Dermot O’Connor of Limerick in 1716, and includes translation of French heraldric rules into Irish. The most notable of the incunabulas is probably an uncoloured copy of the Nuremberg Chronicle (1483). Maynooth University is the new name for the third-level institution located in the North Kildare town. Though formally established as an autonomous university in 1997, the university’s history stems from the establishment of the Royal College of St. Patrick on 5th June 1795 by Act of Parliament. Maynooth University has its origins in the seminary set up on the Duke of Leinster’s lands in 1795, St. Patrick’s College. It was intended “for the better education of persons professing the popish or Roman Catholic religion” and, one assumes, in the hope of stemming ideas coming from Revolutionary France. The seminary was first housed in the house built by the Duke’s steward, John Stoyte, with the lay students in Riverside House (until 1814. Lay students were not admitted again until 1966). Stoyte House was extended soon after by architect Michael Stapleton by adding two symmetrical wings, each with an archway to the grounds beyond (the Long Corridor). The other two sides of the square were completed in 1809 (New House) and 1824 (Humanity House/Dunboyne House), in a similar style to Stoyte House. 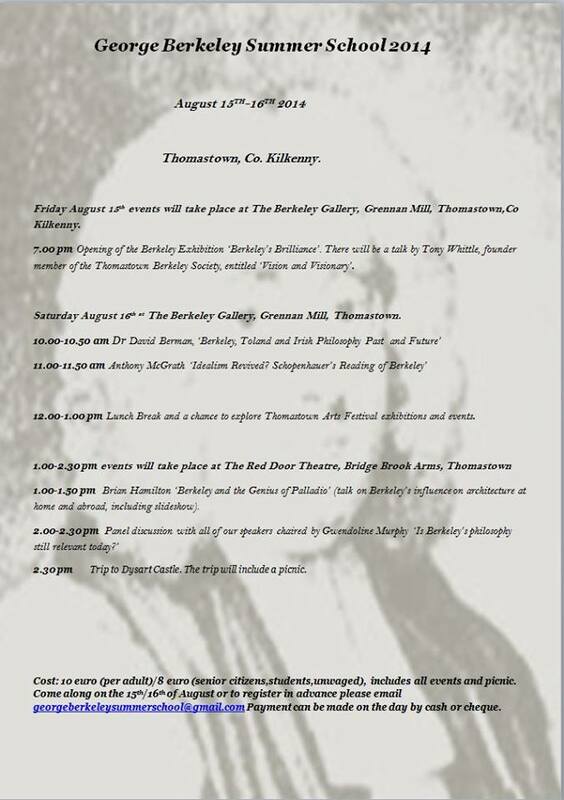 The George Berkeley Summer School will be held on the 15th and 16th of August, 2014 in Thomastown, Co. Kilkenny. George Berkeley was born at Dysart Castle, Thomastown. Cost: 10 euro (per adult)/8 euro (senior citizens,students,unwaged), includes all events and picnic. Come along on the 15th/16th of August or to register in advance please email georgeberkeleysummerschool@gmail.com Payment can be made on the day by cash or cheque. Find out more on the George Berkeley Summer School Facebook page.